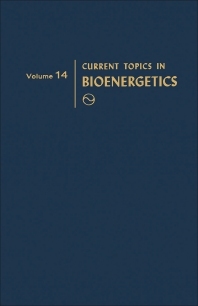 Current Topics in Bioenergetics, Volume 14 provides information pertinent to the structure and function relationship of energy-transducing membranes. This book presents a number of biochemical and biophysical approaches that are valuable in some systems. Organized into five chapters, this volume begins with an overview of cytochrome oxidase, a noncrystallizable membrane protein. This text then determines the interaction of small organic molecules with biological membranes on a molecular level. Other chapters consider the various physical techniques that are used to investigate the structural and dynamic properties of proteins, lipids, and membranes, including neutron diffraction, X-ray diffraction, electron microscopy, optical rotatory dispersion, nuclear magnetic resonance, fluorescence spectroscopy, and Raman spectroscopy. This book discusses as well the biological importance of metal ions. The final chapter deals with optical activity spectroscopy as a recognized tool for the examination of the conformation of biological macromolecules. This book is a valuable resource for biochemists, biophysicists, and biologists.